Tampa Bay including Clearwater Beach is the leading destination on Florida's Gulf Coast, attracting more than 13.5million visitors annually. Foreseeing future growth the city of Clearwater developed land use districts to give a positive and planned direction to the overall layout of Clearwater Beach. Within the Destination Resort districtThe Trident Center was designed to includethree different types of hotels The Vortex Hotel and Spa, the Seaway Hotel Plaza (Resort style Hotel and Wellness Center), and the Windway Hotel (Long stay and entertainment family hotel). The site overall consists of 13 parcels of land within 3 city blocks which are divided by local and arterial roads as well as other neighboring buildings. The vision of the Vortex is to promote tourism to the area by creating a unique iconic destination. 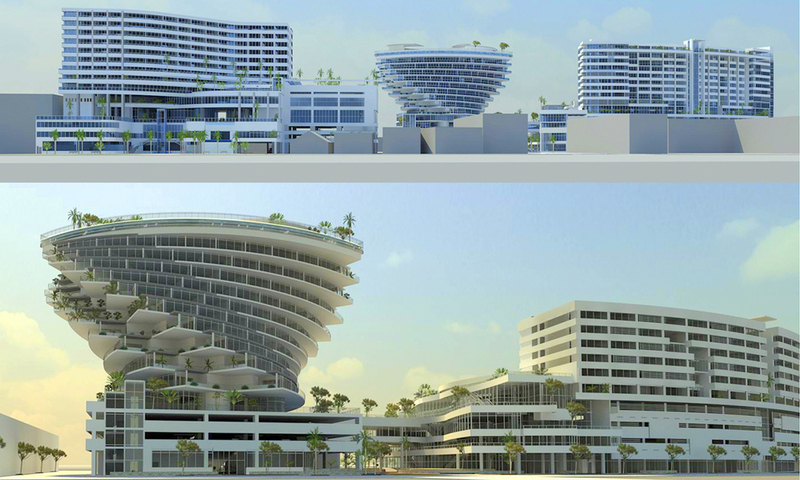 Its structure and design was intended to enhance the vision of the site against its international beach competitors. The Vortex acts as a visual climax of the built Beach Walk, as it is on the trolley route and includes an exclusive Marina. The revolving shaped and relatively small footprint houses over 150 hotel suites, retail, two restaurants, spas, green areas, an open market, parking garages, and avenue for local artists to display and sell their crafts. Via the promenade an open mall allows visitors and residents to enjoy shopping and outdoor entertainment. The Vortex’s parti uses the geometrical system of the Vesica Pisces, twisting on an axial structure. This system reduces the span of the cantilevers as they create the illusion of the dramatic spinning of the internal void and exterior balconies. With its distinctive architecture The Vortex offers breathtaking views of the bay and city from multiple angles, while maintaining an open view corridor on the lower levels and panoramic perspectives as it rises. Given that the predominantly curvilinear forms of the Vortex, it is an attractive alternative to the traditional flat façade structure or terraced buildings, providing a contemporary and international design and adding to the visual diversity with its surrounding buildings.